At the beginning of the endovascular aortic repair (EVAR) era, a large number of patients were denied endovascular treatment as challenging proximal neck and narrow access vessels were responsible for EVAR ineligibility in more than 50% of cases. Since then, stent-graft technology has evolved rapidly, limitations of earlier-generation devices have been overtaken, and EVAR eligibility has increased enormously. Still, in patients with complex aortic necks, proximal graft sealing remains a challenge with traditional self-expandable endograft. 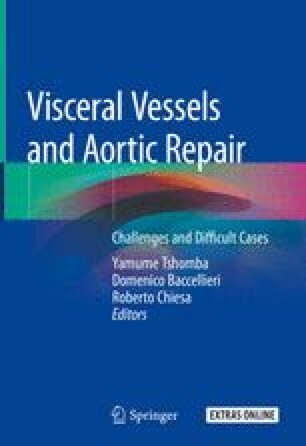 This chapter focuses on the evolution over the years of endografts, in terms of profile and adaptability to challenging infrarenal aortic neck. The final section of the chapter is dedicated to the VENT procedure, a particular EVAR technique that combines the Ovation endograft implantation with open bare-metal stent in the renal arteries and offers a treatment option for patients with unfit challenging neck for traditional endograft.